Looking for a LIFEPAC resource to help you record your student's information? If so, Alpha Omega Publications has the perfect tool to help you! It's the LIFEPAC Parents Cumulative File! This handy manila file holder, designed to help you record important information, contains a checklist of records to maintain, forms for medical history reports, a yearly progress report, transcript records, and an achievement testing profile. A high school academic projection, which helps parents determine a tentative, 4-year course of study, is also included in this Alpha Omega curriculum resource. The yearly progress report will help you easily track and record student progress, and the medical history forms will provide a place for you to document student health and immunization records. Just think, now you can keep every important document of you childs education in one, easy-to-find place! Sounds great, doesn't it? So avoid all that frustration of digging around your house looking for your student's records! 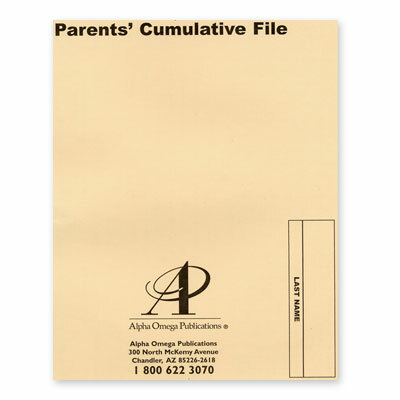 Keep it all together with the helpful, time-saving LIFEPAC Parents Cumulative Folder. And when it's time for your student to graduate from high school, you'll definitely be glad you've spent the time gathering this irreplaceable information so your child can easily transition from homeschooling to college. This is truly one of the most important records you can keep for your homeschool child! Don't delay any longer. Order the affordable LIFEPAC Parents Cumulative File today!